Alien hunters have done it again! Scouring NASA's database of rover photos, extraterrestrial enthusiasts claimed to have spotted a baby bear wandering alone on the red planet's rocky grounds. UFO Sightings Daily writer Scott Waring announced in one of his latest blog posts that a bear-like creature was spotted by fellow alien hunter Paranormal Crucible of YouTube in one of NASA's photos. 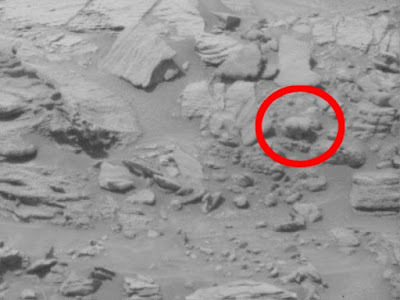 Waring claims that this is a proof of living creatures existing on Mars, and adds that this is why NASA posts photos only in black and white. "There is a reason NASA puts photos into black and white. To hide the living creatures and plants that are an obvious color," Waring wrote in his blog post. There is a version of NASA's photo on his site with the bear colored in for easy viewing. Aside from a bear, the UFO hunters claimed to have also found a prairie dog, a squirrel and even an alien woman watching the Rover from a distance on Mars. NASA rarely, if ever, comments on these sightings, save for a rare refute of the claim that NASA is hiding information of extraterrestrial life from the public and the possible reason why UFO hunters see what they want to see on Rover photos. "There is no group that would be happier to see such a thing than the 500 scientists around the world who work on this Curiosity rover," NASA scientist Ashwin Vasavada said, adding that they haven't seen anything remotely like what the UFO hunters claimed to have spotted so far. Vasavada added that he blames the sightings on pareidolia, or a psychological response that tricks the mind in seeing what it wants to see when it spots familiar objects in new or random places. Nevertheless, UFO hunters are convinced with what they saw and are relentless in their quest to let the rest of the world know the truth. Waring said that he will send this information to the UN Secretary General Ban Ki-moon via Twitter in his attempts to spread this sighting to the world. "I will send this to the Secretary General of the United Nations...(as) I often alert them about these amazing discoveries," Waring wrote in his site. While he has yet to receive a positive response, he is continuing his efforts along with a plea for others to share these findings and "help them open their eyes and see the truth."